Are you looking for great kids party ideas? Some people get so worried about putting on a good party. It can seem really daunting and difficult to know where to start. That's where we can help, party planning is easy if you just do a little preparation and be prepared to join in. Here you will find all sorts of great party themes; something for everyone. Also included however are all the little insider tips and wrinkles to help your kids party go with a real swing. 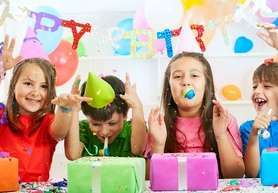 All the kids party ideas you will find on these pages are tried and tested on real children. We know what kids really like and what works. 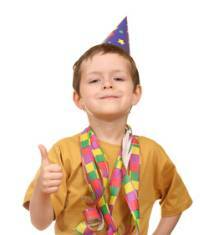 We have lots of great kids party themes and loads of ideas and party games to make them all real winners. At the end of the day however a lot of it is down to you. But isn't that part of being a parent? Don't forget also that planning and preparing decorations and invitations for your party are half the fun. Its a great way to spend a bit of quality time being creative with your kids and squeeze the maximum juice out of their birthday as possible. Every one of the kids's party ideas below is broken down into simple clear parts. You can quickly and easily see what is required to put on the best kids party ever!